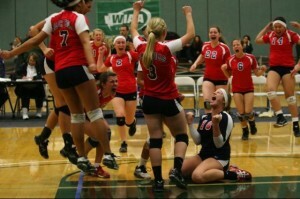 In 2010, Jensyn McCoy and her Black Hills High School teammates defeated rival Tumwater High School for the district championship. 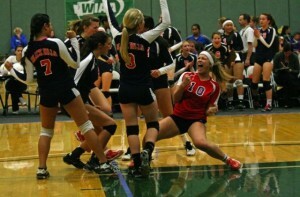 McCoy (number 10) will carry her talent and enthusiasm to Central Washington University next year. Too often in life people focus only on what’s in front of them. Jensyn McCoy does not have that option. The senior libero (middle hitter) for the Black Hills High School volleyball team not only has to keep her focus forward, but also to the left, right and behind. Along with her accomplishments for Black Hills, Jensyn McCoy has had a successful career on the club volleyball circuit. A three-year member of the Wolves varsity team, McCoy is one of the best players in the Thurston County area. Not surprisingly, McCoy will continue her career collegiately. She has verbally committed to play for the Wildcats of Central Washington University next year. This season, with the loss of standout Hope Mortensen (who will play at Saint Martin’s University) and longtime coach Kara Peterson (the new head coach at SMU), McCoy will have to take her game and leadership to new heights in order for BHHS to be successful under first year head coach Tika Chandler. What will also help McCoy’s development on the court is her seemingly vast experience at the club level. 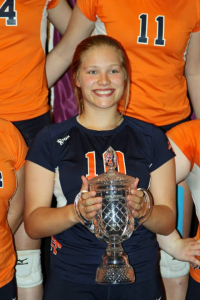 In the summer of 2012, her LTVC team qualified for nationals, and this past July, the team again traveled to the tournament, this time within a non-qualifying division. Playing against the best in country is a way to find out what you need to work on, and what the competition looks like at the highest level. Along with her high school and club coaches, McCoy has been able to receive guidance and instruction in the sport from her mom, Kim Hartley. Hartley played at Green River Community College and introduced Jensyn to volleyball at a very young age. Hartley also succeeded since McCoy is much than just an athlete. McCoy will likely graduate near the top of her class, sporting a 3.9 cumulative GPA. The work ethic that made her a successful volleyball player has helped her in the classroom as well. Along with balancing her time between school and volleyball, McCoy will have to balance a variety of roles on the Wolves team this year. While she wants to help lead the Wolves as a hardworking example, she knows encouragement and guidance are important for the younger players. A soon to be four-year member of the varsity team, McCoy has seen some of the team’s best moments in school history. 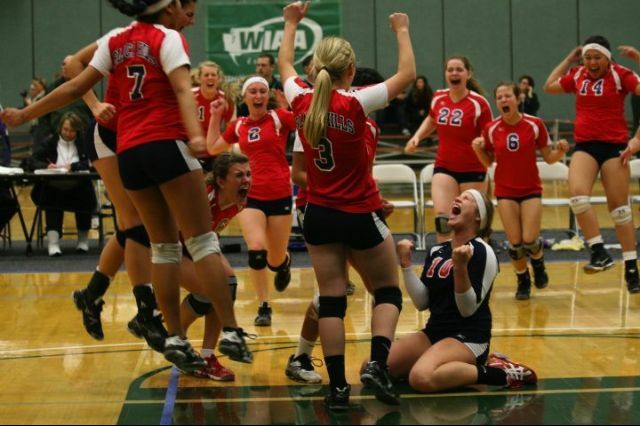 In 2010, as a freshman, McCoy was part of a BHHS team that defeated rival Tumwater 3-2 to take home the district championship before falling in the quarterfinals of the 2A state tournament. Now, entering her last season, McCoy is happy she can just focus on playing, as she’s already made her collegiate choice. At Central Washington, McCoy will play alongside former South Sound standouts Erika Waldner (Tumwater High) and Lauren Herseth (Olympia High). The transition to the next level will be made easier thanks to her communication with Herseth. Central is certainly getting a great resource in McCoy, as she has already left an impact at Black Hills. Going into this season, McCoy believes the Wolves can have a special season if younger players can quickly acclimate to the varsity level.